Jill Scott, right, agrees with Oprah that some rap music and videos are misogynistic and not in the best interest of the black community or the image of black women. Ludacris, Ice Cube and 50 Cent have been criticizing Oprah for either not having them on her show or editing their comments when she does. Oprah has stated that she likes some hip hop music and videos but does not like those that denegrate women. Oprah and Jill Scott are calling on the community to find a way to change these images. 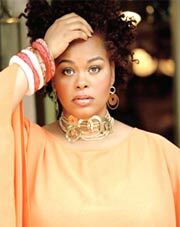 Jill Scott was quoted in The Washington Times concerning the negative portrayal of women in rap, "It is dirty, inappropriate, inadequate, unhealthy and polluted."